February already, it seems the year just started. Regardless, it’s still a great time of year to reflect on new things. While new resolutions, new diets and new ideas abound, here, with a change of the educational baton at the Chemung County Historical Society, the new season of school and outreach programs has kicked off. For us, it’s a chance to encourage young historians from all over the county to learn more about our museum and the stories inside. 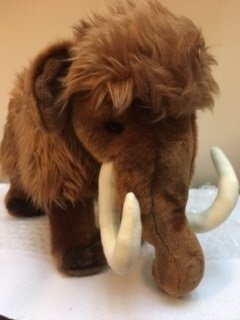 When I recently asked a kindergarten class what’s inside a history museum, I was delighted to hear the reply, “everything!” And, cheering us on is our trusty and beloved museum ambassador Mark the Mammoth already known on Facebook and Twitter for his quirky antics. Our mammoth loosely represents the Big Horn Mammoth tusk or horn discovered in the Chemung River similar to the one prominently displayed in our main gallery. It is the confessed current favorite museum artifact of our own Director Bruce Whitmarsh, and is our mascot of mirth. Seems to fit, as Mark gets his name from another important Mark associated with Chemung County. 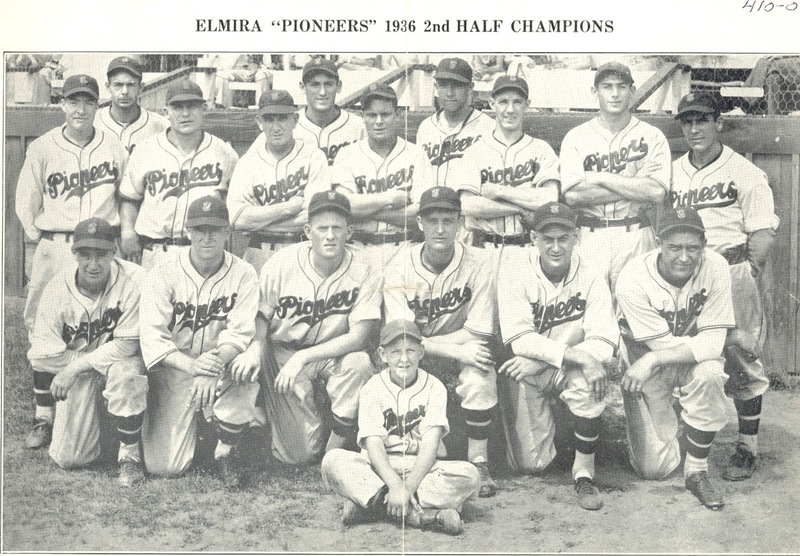 First, we have the Elmira Pioneers in 1936 posing here as 2nd half champions. 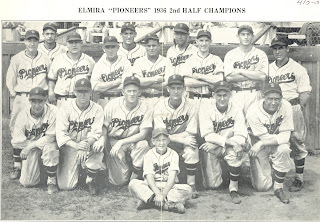 Note their mascot was youngster H. Arnold, who probably doubled as their bat boy. He looks pretty pleased with his role, I’m just wondering what happened to the first half champions? Likewise, many local homeowners may have considered the LaFrance Fire Engine’s Dalmatian mascot especially lucky when they needed help. 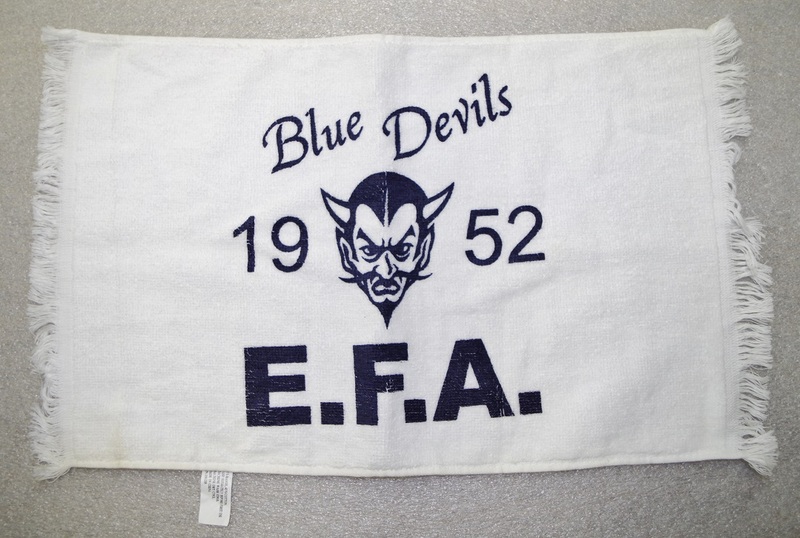 and an image of Elmira Free Academy’s Blue Devil mascot. EFA is proud of notable alumni like Hal Roach (1908), Ernie Davis (1958), Bob DeLaney (1942), Tommy Hilfiger (1970), and Eileen Collins (1974). 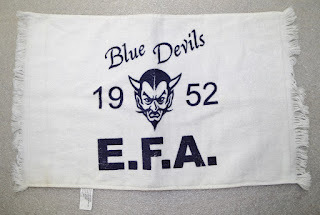 Today, known as the Ernie Davis Academy and serving grades 8-9, their mascot remains a blue devil, but they identify as the Elmira Express, a nickname given to the legendary Heisman winning Ernie Davis, a player noted for his exceptional speed. Over the years, mascots change. 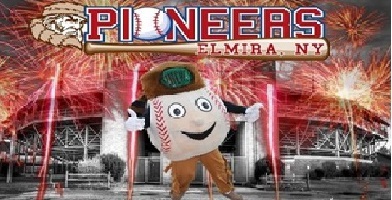 Today, our local Perfect Game Collegiate Baseball League Elmira Pioneers use an image of a fierce pioneer as their logo but their mascot Stitches is the one who cavorts with the crowd to bring the team luck. And the new Federal Hockey League Franchise, The Enforcers have their version too. 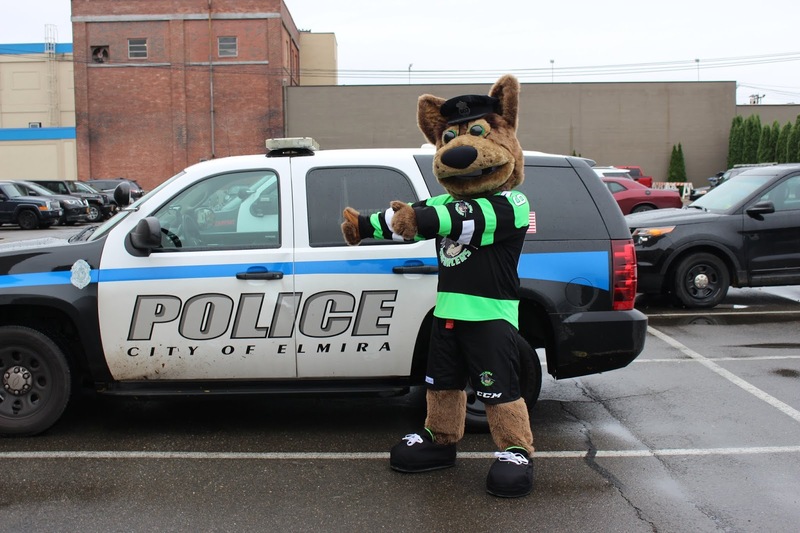 While their logo shows a burly police officer, their good luck charm may be their mascot Captain K-9. Like all the other mascots, he shows up at games to engage the audience, and charm the crowd. 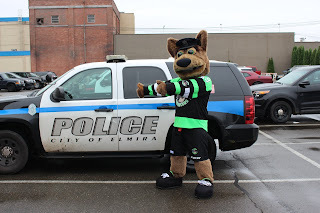 He is a dog who accompanies the Enforcers ice hockey team at home and away games, strutting his stuff. Our own icy mascot has changed too. Here at the Chemung County Historical Society, we’ve kicked off our new year introducing a new version of our mascot on Twitter and Facebook and now Instagram. He’s a smaller, leaner dude with just the right attitude. Already out visiting school classrooms, fairs, and even posting some of his exploits (with help), we’re finding he’s a good match for February’s cold and ice. Follow our icy @MarktheMammoth on Facebook, Twitter, and Instagram and our wish that he brings you good luck too!